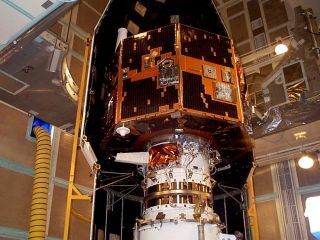 The IMAGE spacecraft as seen in 2000, before its launch. Six months after NASA last picked up a signal from a long-lost spacecraft, engineers have been unable to re-establish communications with the satellite, the agency confirmed in a new statement released yesterday (Aug. 28). That spacecraft, the Imager for Magnetopause-to-Aurora Global Exploration (IMAGE), launched in 2000 and worked perfectly until 2005, when the satellite unexpectedly stopped communicating with Earth. But in January, an amateur astronomer suddenly picked up a signal matching the spacecraft's communication system, and NASA later confirmed that it was indeed the long-lost IMAGE. Since the rediscovery, engineers at NASA and the Johns Hopkins University Applied Physics Laboratory have been attempting to re-establish a steady communication line with the spacecraft. That would let engineers evaluate the instruments on board and determine whether it would be worth trying to salvage the spacecraft. And at first, rescuing the spacecraft seemed plausible: The engineers retrieved some initial data from the satellite and confirmed its batteries were still working. But at the end of February, the spacecraft broke off communications again, and since then, the signal from the satellite has been spotty or nonexistent. In yesterday's update, the first NASA has released since May, the agency confirmed that the communication problems continue. Engineers still haven't managed to lock in on the lost satellite's signal, and the spacecraft is still ignoring all commands being sent to it. During its career, the spacecraft was the first to map the entire magnetosphere, which is the area influenced by Earth's magnetic field. The magnetosphere plays a crucial role in protecting Earth from solar radiation.